Symphony Worlds is a little like Audiosurf and a little like Asteroids. 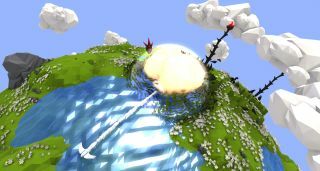 The game reads a music file that you feed it in order to generate a spherical planet that serves as the dueling space for you and an AI opponent. You also pick an "enemy song," as Empty Clip Studio co-founder Francois Bertrand described it to me, which affects your opponent's tactics. In this case, I was up against the polygonal manifestation of a Justin Bieber song, a horrific incursion against my peaceful world of dancing cacti (a planet birthed from "Bad Romance" by Lady Gaga). I literally had to destroy amplifiers in the world that were outputting Justin Bieber. You can't ask for better motivation in a video game. Symphony Worlds should be out in early 2016.